As you know that we are also using some services and products to make Blogging House a great blog. I have used these blogging tools to run this epic blog. I regularly use new tools and get a new experience of using. These are my Blogging Resources for you. Resources Page, this is a great method to tell the visitor which tools you are using. I have also created this page to make you know that these are the products and services that I have used. I hope so you will also using them. 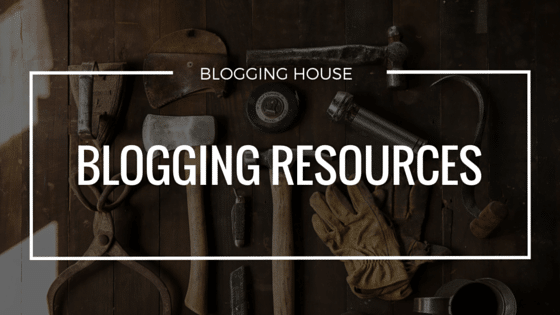 Here are my blogging resources and tools for you. Don’t forget to share this post. That’s the best business class web hosting provider. InMotion Hosting is the affordable hosting provider which is famous for their business class hosting. Blogging House is hosted on InMotion Hosting. We can proudly say that InMotion Hosting is the backbone of Blogging House. InMotion Hosting is giving reliable business class web hosting at affordable price. They are offering 90 days money back guarantee with the purchase of any web hosting plan. InMotion is the only web hosting which is giving SSD for free. As you’re Blogging House reader, I am giving you 6 months free web hosting from InMotion. Whenever someone asks us “which platform is best for blogging?” our answer is WordPress. WordPress is the best blogging and CMS platform which is used by the most websites on the internet. With WordPress, you can do a lot of things that you want to do. WordPress is really easy in fact, it has skill levels which are ranging from beginner to expert. I don’t think so I have to describe reasons why I am using WordPress. Genesis Framework is a WordPress theme by StudioPress. I don’t think so StudioPress needs any introduction. I highly recommend Genesis Framework. It has the ability to make your site rocket fast, SEO-Friendly and awesome. For developers, Genesis is an amazing thing. It’s easy to customize and you can create your dream child theme with Genesis. There are many child themes available which you can buy and install on your site. I am not using Genesis on Blogging House but for my clients, I have used it and recommends it. And many more features. Read all of them here. I think you should also try this eye-catching theme. Yoast has changed the world of WordPress SEO. WordPress SEO by Yoast is the plugin that improves the SEO of a WordPress site. Yoast SEO is considered as the best SEO plugin due to the features they provide. Blogging House and many popular blogs are using this plugin to improve their ranking on search engines. We have been using this plugin on various sites that we have managed. SEMrush is the best tool for competitors’ research. You can find your competitors’ keyword easily by using SEMrush. As you know competitors are a great source of ideas and ranking. I think SEMrush is a must-have and must-use tool for every blogger, marketer, SEO and researcher. With SEMrush, SEO is easy and you can save a lot of your time. SEMrush is used by companies, agencies, SEO firms, bloggers and anyone who want to spy on competitors. I have written an article about SEMrush Keyword research, I hope you will also like that. That’s the Long Tail Keyword tool which provides you the keywords that you can easily rank. Basically, the feature of HitTail is that it gives you the keywords which have a great chance to get your rank on first age of Google. Yes! HitTail gives you keyword suggestions. Well, HitTail imports your keywords from Google Webmaster tools and then give you the best keywords (with rating) on which you can rank higher. I have written a detailed HitTail Review which will show you the feature and the working of HitTail. And many more SEO tools. I can’t remove this plugin from this list. SumoMe is giving free tools for marketing. Yes! Just install their WordPress plugin and your site will be rocking. They are giving tools to build your email list, contact forms, social sharing buttons and more. Their “Welcome Mat” is the email list building tool which is now used on many top blogs. They are having Free and Pro plans. I am using FREE plan. Well, building the email list and collecting subscribers can be done with SumoMe. Now, you’re thinking how to send emails to these subscribers? Aha! MailChimp is the only service which is giving good email marketing service. MailChimp is free for first 2000 subscribers. If you’re out of budget or not having money then MailChimp is your friend. It’s easy to use and can design beautiful email templates. I can’t live without this awesome plugin. Super-your WordPress site with Jetpack. After W3C Total Cache, WP Super Cache will be my first choice for the cache plugin. Actually, W3C Total Cache is a little bit difficult for beginners because it contains some advanced options. That’s why we have included WP Super Cache in this list. If you’re a beginner and want a simple cache plugin then install WP Super Cache. It’s easy to use. Note: Some of above may contain affiliate links. I will receive a little commission on any purchase you make but this will not make any difference of price for you. I have done hard work to write these blogging resources. Buy me a coffee!